How do I erase and rewind? Well, aside from a quick staycation with the family, don't get me wrong, I do have "me-time" din naman! And usually, "me-time" pertains to me spending 1 full day driving myself to my favorite "beautifying" places, kahit na opposite directions pa sila! That's how worth the visit they are! I've had once where 8 out of 10 of my toes were bleeding from a super "robotic" nail technician who didn't seem to hear my complaints and screams! I was too young back then so I just kept my mouth shut and bear the pain! Obviously, I've matured (bakit ang haba ng kwento ko? LOL), so I make sure to pick a place where they do not only take care of your nails, I have high requirements for staffs too! They should be friendly, but also knew when to give you that much needed "quiet time". That's me with the friendly staffs of Nailaholics, Glorietta Branch. Since I'm always in a rush, I always go for manicure and pedicure session with a quick polish application. Of course, if you have more time than I do, feel free to try their other services like Foot Spa, Hand and Foot Paraffin and so much more! They have packages for you to choose. Then, there's brows! I have my brows fixed at Benefit Brow Bar at least once a month. Obviously, my schedule depends on where I will be so I actually rounded up all branches of Benefit Brow Bars and truthfully, I can't seem to pick a favorite as I get 101% good service from all the Brow Artists! Holler to all the Benefit Brow Artists who has done my brows (ang dami nila!) They are all super friendly, professional and really good! Always ask them to shape and teach you how to do your brows after Brow Wax session. I like how my brows changes PER brow artist, I get a good look on how my face changes on different brow styles and shapes! 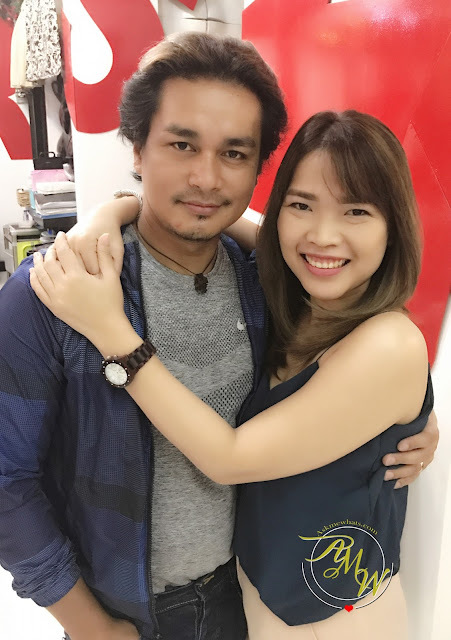 Next stop is my hair color, I don't color my hair often and my Beauty Blogger Friend Lush Angel Angela would know how difficult it is for me to schedule a hair coloring session with the master Fred Penales at Hairshaft Salon Podium. As you all know, hair coloring takes a bit of time and I'm always fidgety inside a salon worrying about the traffic that would greet me after. But obviously, because I get the most positive response for my hair color whenever I have my hair refreshed or colored at Hairshaft Salon, I really take the effort to visit him whenever time permits! So there are days I really go all the way from Fort or Makati to Ortigas just to chase after Fred's magical hands. Miguel of #Miguelized is also a genius in hair color! I've seen him transform "blah" hair to "vavavoom" EVERY SINGLE time I visit the salon. There's also Carl of #Carled ! This is my most recent hair color, Light Ash Brown tone. Whenever you visit any salon, make sure to communicate well with the Color Technician on your preferred color, better yet, show them pictures so they get a good idea! And of course, you have to let them know your hair treatment/hair color history. When it comes to services like these, communication is definitely KEY. Of course, to rewind doesn't have to always entails me to be outside, I also rewind at home whenever I get too busy! I like to apply nail polish at night when the son is asleep and use Essential Oil Spray from Aroomatics. And I also like to get updated with new polish launches and actually use them and test them! Just like the newest Girlstuff To the Moon and Back Glitter and Dazzle polish that can help create 3D celestial themed mani! Do follow me on Instagram @AskMeWhats as I will show you my digits soon using this new polish. Then the newest "base coat" excites me the most! Long time nail art lovers who follows my tutorials knew how much of a base coat lover I am! I have searched and reviewed the BEST base coat out there and I'm glad to know one of my favorite polish brand Girlstuff and Solique came up with their own base product. GirlStuff Nail Revive Base Coat - contains argan and baobab oils, vitamin E and Violet Extract to help stimulate nail growth, thickens and makes nails stronger. Protects nails against splitting and breaking. Smoothes nail surface as it moisturizes nails and maximizes the natural shine of nails. Solique Anchor Grip Gel Base Coat - increases your manicure wear even longer! Both are available at www.girlstufforever.com. How do you erase and rewind?